A heroin overdose can be fatal. 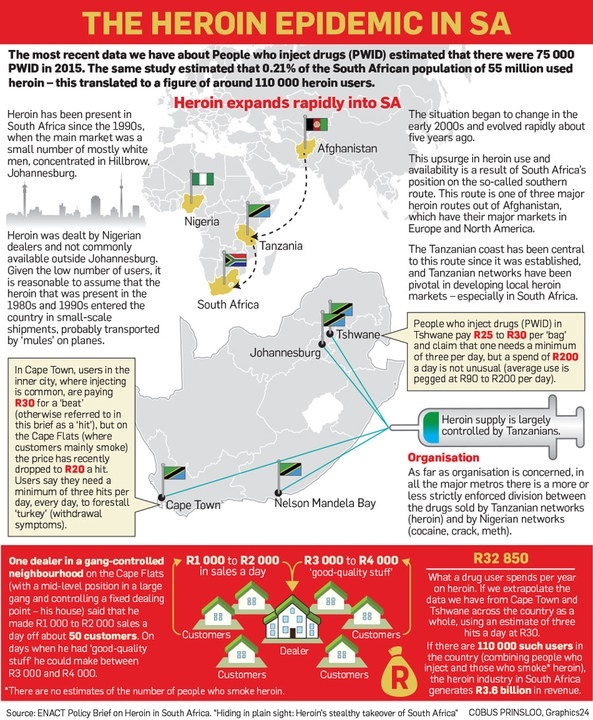 A hard-hitting report on South Africa’s heroin market states that the deadly trade is lucrative and more embedded than previously believed – and facilitated by gangs, organised crime and incompetent or corrupt police. And central to it all are Tanzanian traffickers. 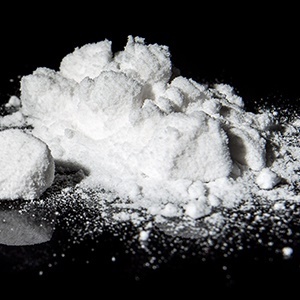 The report released on Thursday, a policy brief titled Hiding in plain sight: Heroin’s stealthy takeover of South Africa, is authored by Simone Haysom, a senior analyst at the Global Initiative Against Transnational Organised Crime. At its launch, the EU’s deputy head of delegation to South Africa, Raul de Luzenberger, said: “Every family is at stake … everyone is at risk … drugs will arrive everywhere and the crime associated with drugs and the need to get the drugs will affect everyone. The report followed last year’s Enact (an EU-supported project that monitors and develops responses to transnational organised crime in Africa) study on The Heroin Coast, which looked into the transit heroin route across a portion of the east coast of Africa and South Africa for transhipment to, primarily, Europe and North America. The findings revealed the degree to which this trade had become embedded in local political systems, and in time, had generated local markets of a surprising scale. The report also argued that the upsurge in heroin use and availability in South Africa was because of the country’s position on the so-called “southern route”. This route was one of three major heroin routes out of Afghanistan – the major producer of the drug – which had its major markets in Europe and North America. “Until recently the southern route was considered to be the poor relation of the Balkan and central routes, which travel overland – and a much shorter distance – from Afghanistan to Europe. “However, the southern route has become much more significant since 2000. “This has occurred for a variety of reasons, but principally because of an increase in opium production in Afghanistan; increased enforcement on the other routes; and persistent impunity for traffickers operating in east Africa,” the report found. Central to this route was the Tanzanian coast. “Tanzanian networks have been pivotal in developing local heroin markets – especially in South Africa. “The heroin trade in east and southern Africa must be understood as comprising a high-volume, highly lucrative transit trade destined for primarily European and Canadian markets and a relatively lower volume regional trade for local consumption that has spun off the transit trade and developed dynamics of its own,” the report found. For example, in Cape Town, Nelson Mandela Bay, Johannesburg and Tshwane, Tanzanians largely control heroin supply, the report found. In suburbs where South African gangs control retail drug markets, Tanzanians act as a “wholesalers” and supply heroin to those who distribute and sell it. “In all cases they maintain a low profile, to the extent that they tend not to retaliate against local gangs if they are robbed. This has led to their developing a reputation for being loosely organised and ‘peaceful’,” the report said. But this might be more of a strategic stance than anything else. The rapid emergence of the thriving industry had gone largely undetected by police and government despite more than 100 000 users countrywide and with an estimated annual turnover that might be worth billions of rands. Furthermore, the problem was made worse by poor drug policy and neglect of marginalised communities. South Africa, according to Enact, was at risk of contributing significantly to the surge in drug use in sub-Saharan Africa, which is expected to have 20 million users of hard drugs by 2040. “It’s a potential crisis, but there is insufficient policy attention being paid to it. The problem is exacerbated by poor policing, absence of crime intelligence, and the failure of the state to provide adequate social care or education and health services,” said Eric Pelser, Enact programme head at the Institute for Security Studies. The report argued that a comprehensive policy response to South Africa’s heroin economy should encompass not just law enforcement and public health responses but also broader measures, including political approaches to dealing with the corruption that accompanies drug trafficking and more creative development interventions to address the drivers of community vulnerability.